The first Mel's the Original was born in San Francisco in 1947 and has expanded across North California as a 50's style diner. It has a black and white, stainless steel motif with a lively do-wop atmosphere and littered with flashing neon signs and the obligatory pictures of Marilyn and Elvis. Besides cheeseburgers and fries, Mel's serves breakfast, salads, sandwiches and cafeteria quality dinners. At $5.59, the Mel's Burger was fairly priced but will not have me returning anytime soon. The one-third pound, fried to a dry leathery state patty was without any redeeming qualities. It resembled a darkened rawhide dog chew without the flavor. The menu claimed that it was cooked with "Mel's Magic Seasoning," but with dead seasonings like that, Mel is wise to keep it to himself. That Pets Mart patty was topped with a thin layer of yellow which I assume was their attempt at cheese. Piled on top of this disaster was a fist full of chopped, Clorox flavored iceberg lettuce, thin slices of onion, and firm red tomatoes and dressed with a very runny 1000 Island type sauce. The bun was a major step up but was not perfect. It was a heavy, crusty yet chewy, toasted bun baked at the restaurant. The bread while superior to the buns found at most fast food hamburger restaurants tasted like it was formed from frozen dough. It still had a good flavor, and half way though the meal, I pulled out the puck-like-patty and ate just a sauce sandwich. The fries were a high quality, skin-on frozen potato. These tasteless spuds were doused with season salt to add flavor and were left on my plate next to my thirty-seven cent tip. A trip to Placerville is always a delightful experience for those of stuck in the suburbia. It gives a chance to test out the four wheel drive option on our SAV's (suburban assault vehicles), and chance to see what color the sky is supposed to be and to experience the way air is supposed to smell. 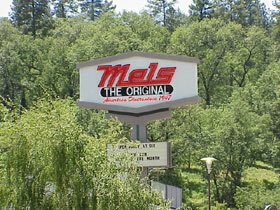 Today we went to "Original Mel's of Placerville", in reading the front of the menu I learned this store is fashioned just like the original "Original Mel's" in San Francisco that was featured in the film American Graffiti, which was supposed to be in Modesto???? Hey I don't get it either, but I was pleased to see that there must be some sort of waitress school the employees attend because our waitress had the exact charm of "Flo" from the hit series "Alice", which centered around another Mel's that may or may not be original. Our "Flo" was a sassy little thing that would not divulge a single fact about the franchise, cooking style, fries, or where we could buy some cool Mel's gear. She knew were from out of town because my SAV was missing a gun rack, red dust, and dents. We told her were reviewers from cyberspace and she immediately became suspicious. We ordered a Melburger with Melfries and a couple of Cokes. Flo was trying to steer us into a couple of Melshakes or a Melmalt but I said "Mel No! ", we are not starting the shake thing again. After my day in Placerville I reflected on my experiences with mountain hamburgers. At Powell's (see Powell's review) they need a sign up that says BYOB: Bring Your Own Bun, and at Mel's a good sign would implore you to come for the buns and stay for the conversation. Maybe in a take off of the old peanut butter cup commercial a couple of burger fanciers could be walking down Main street each enjoying their own burger, when suddenly the slam into each other mixing up their meals. One truly excellent burger would emerge and the other one could be dumped in the men's room at Powell's.